Will not cover attachments such as baggers and sprayers etc. We have an L120 that needed a new cover after 6 years of wear. This cover fits great and is very durable. 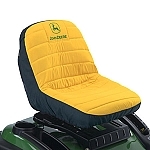 It doesn't have the little built in pouch that fits snuggly over the seat back like the one we had, but it's large enough that it still covers the whole mower and deck well. I expect it will last as long as the original. I bought this cover for my JD D110. It arrived very timely and fits perfectly. John Deere has quality products and pays attention to even little details like the attached storage compartment. I would definitely purchase more Deere products and look to Green Fun again. 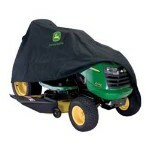 I have purchased this cover for my 2011 D150 which stands inside during summer when not being used. Ask me again in the spring, how it stood up to Wisconsin's winter while standing outside. (I will reinforce it with a tarp over the winter). The cover is exactly the right size and kept my D170 dry during recent rain storms. Easy to put on and take off. Pleased with the quality of the cover. Fits well. Can't wait to see how it holds up over the months being outside. Will uncover the tractor in Spring. A bit pricey on the cost but you pay what you get,a cover made to last. I've bought the lesser priced covers and they might last in the Texas climate about 3 1/2 months before they rip or tear. This cover is built to last, also has a 2 year warranty.